Just like an article’s headline sells the story, cold email subject lines sell the email. It acts as the gatekeeper to any contact you’re trying to make, telling them if you’re worth having a conversation with or not. And if your goal is to get an in at a company that you’d like to work for, then it is even more important to find creative ways to get the recruiter to open and read your cold email. After all, the process of landing your dream job all starts getting the attention of the right people. So, how do you do this? It all starts with being very proactive. While cold email might seem pretty intrusive at first, it is a great way of expanding your network to include contacts that can help advance your career. Whether you are angling for a call, interview, or simple informational interview, cold email has the potential to open amazing doors for you. But that doesn’t mean the process will be smooth sailing all the way. If you go in without thinking and planning ahead, you could easily lose out on all the benefits of cold email. And it all starts with the subject line. Since you only have a small window to wow any hiring manager, how you open your email will spell success or failure for your new career aspirations. The best subject lines for cold email do this by providing value and appealing to the recipient’s curiosity. They also have a touch of personality to show your prospects that they are dealing with a real person, not spam. Writing a great cold email is hard enough. But what if all your hard work is wasted because recruiters aren’t even opening your messages? For many people, having good subject lines for job emails is a bit of an afterthought. But you will not get the chance at any new position if hiring managers don’t decide to open and read your message first. And this fact is backed by science. A recent study that involved sending out 1,000 cold emails showed that your open rate is primarily determined by two things: the sender name and subject line. Simply put, your email subject lines for job inquiries must be able to catch the eye of any hiring manager or recruiter. You can do this by providing value, creating curiosity, being creative, or speaking to a shared interest. That is the only way to make sure that your message gets read by the right people. Many email services like Gmail and Yahoo cut off subject lines after a certain number of characters (depending on the service). This means that, if your subject line is longer than this, the prospect won’t be able to see anything that could convince them to open your email. So, keep your cold email subject lines as short as possible. This tip becomes even more important when you consider that most people skim through new emails on their mobile devices first. Smartphones offer an even smaller snippet of your opening lines, so it is vital to take that into account when crafting yours. Specifically, a typical inbox shows up to 60 characters of an email subject line. On mobile devices, this number drops to 25 to 30 characters. With such limited space, you will only have six to eight words to get to the point. Because of this, you will have to start with the most important words first. Since you don’t know how much of the subject line the hiring manager will want to skim through, put the most critical information at the beginning of your cold email subject line. Otherwise, your most compelling details could get cut off. A huge part of what makes any cold email successful is building trust with the prospect. But so many people cold email subject lines that are so obviously “sales-ey” that the recipient doesn’t have any other choice but to dismiss them as spam. Of course, you should play to your strengths so that recruiters see you as the best person for the job. But it is also important to keep an element of realness in your subject lines. Craft subject lines that feel like you are writing to someone you know. One way to make your message look more human is by avoiding too many capitalized words. In real life, no one writes like that! 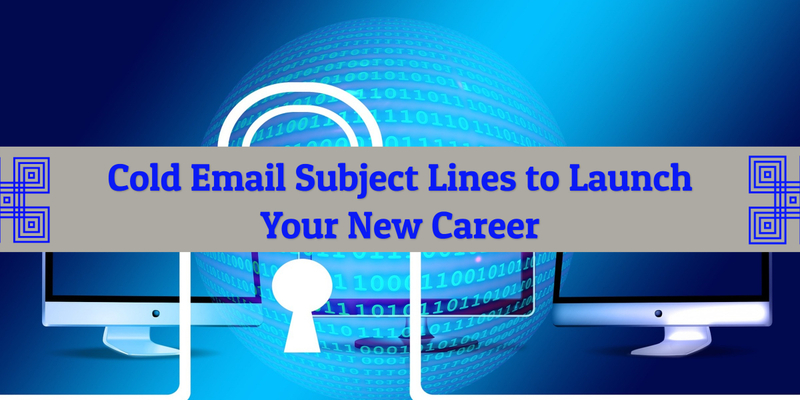 So why should it be any different when it comes to your email subject lines for jobs? Before sending out any cold email, you must ensure that you’ve done enough research on the hiring manager as well as their company. The main goal here is to come across as someone who is skilled for the job but also cares enough to know how they will fit in with the company’s culture. In the professional world, a great way to do this is by asking for a referral from a mutual contact. This will give you an instant boost of credibility with the recruiter and increase the chances of them opening and reading your email. But that doesn’t mean that you can’t reach out without a mutual connection. It might be harder, but you can still succeed if you do your research right. Why should they want to open and read your email? Will they gain anything by interviewing or even hiring you? What makes you an asset? The first and most important step to answering these questions lies in making your email as relevant and specific as possible. If you want a reply to your cold email, it all lies in the details. Also, remember that no one likes being tricked into opening an email that claims to offer one thing and turns out to be something else. Bait and switches will never turn out well for you or your job prospects in the long run. Yes, it is important to make your cold email subject line as appealing as possible. But it should also be relevant to the content and context of your email. You also have to keep in mind that most recruiters spend less than ten seconds reviewing a resume, so they are likely to spend even less time going over your cold emails for job. As a result, your subject line should clearly communicate what you’re looking for without the recruiter having to open your email. That means you have to keep away from any vague subject lines. Let’s say you manage to craft an incredible subject line that assures the hiring manager that they’re about to meet an amazing candidate. But, once they get to the actual email, they are thoroughly underwhelmed. This could get you thrown into the trash folder very fast, with no hope of succeeding in any later contact. So, it is important to get it right the first time. Spend lots of time creating good subject lines for job emails, but don’t overlook the content itself. And your email copy should genuinely try to be relevant and offer value to the recruiter. Show them why you would be a great fit for the company and position that you’re angling for. Even with all these tips and tricks, it will take some time and analysis to find the best subject lines for cold emails that will work for you. That’s why it is important to Always Be Testing. So test everything but only keep what works. When you start sending out your cold emails for job, try a lot of different subject lines for each message. This will give you a good idea of what direction you should be going in. What made you open this email? What did you expect to find in the copy? What made you respond instead of deleting it? What made you feel that this email was relevant to you? This kind of feedback – when you get it – will help you find out what made the recruiter open and respond to your email. In turn, this knowledge could be the secret sauce that helps you land the job of your dreams. Writing compelling cold email subject lines that manage to both get the hiring manager to open your message and take action is an art. It won’t do you any good to have very high open rates but minimal response rates. After all, your goal isn’t to just send out tons of emails – it’s to get a job. Your recent interview/story/article on (mention specific topic) blew me away! Interested in (mention specific benefit of your skills)? What did you think about (mention relevant industry event)? Any advice for someone who loves the (mention specific) work you’re doing at (name of recruiter’s company)? How can I make a contribution to (name of hiring manager’s company)? The main point of any introduction or networking email is to reach out to people who may be able to help you advance your career or make a change soon. This is a great approach because most new job opportunities will come from your own network. If you are a thinking about making the switch to freelancing, or you’re a freelancer looking for new clients, then you will need some pretty catchy subject lines for sales emails. Is (mention relevant topic) a priority for you right now? What would it mean to you if your business was able to (mention specific benefit)? Did you know (mention thought-provoking statistic)? It can be very hard to capture the attention of a recruiter or hiring manager who doesn’t know you. But if you can prove that you are a consistent and reliable candidate, then you will most likely be able to get your foot in the door. No matter how creative your subject lines are, you won’t get far without consistent follow ups. When writing a follow up email subject line, you should make sure that you are providing vital information the right way. That means telling the recruiter why you’re reaching out and giving them a good reason for getting back to you. This is especially important when you’re trying to show that you’re the right person for a particular job. Whenever possible, be sure to use the recruiter’s name in the cold email subject line. After all, the more personalized your whole email is, the more benefits you will reap. Ask a relevant question about the recruiter’s business, company or industry whenever it makes sense to do so. This move could make a crucial difference and prompt the hiring manager to read and reply to your email. That said, you have to provide enough context for your question in the email body for this to work. Have time for another chat? As with any cold email, the subject line must show that you know something about the person you’re reaching out to. Hiring managers always appreciate the time and effort that goes into doing a little extra research. The same goes when you are sending a cold email job application. Do your research into the company that you want to work in. Also, find out a few tidbits about the hiring manager or interviewer’s job title, role, and background. It is important to keep in mind that your cold email will give the recruiter their first impression of you. So while it is important to come across as a skilled professional, you also have to show that you’re passionate and excited about getting the chance to work at their company. If you love the work your prospective employer has done, tell them! Showing your enthusiasm in this way is a great way of expressing your personality without coming off too strong. In the same way, don’t be afraid of getting personal. A good way to do this is by using the hiring manager’s name in the subject line. This shows them that you’re paying attention and actively taking part in the conversation. If someone referred you to a hiring manager, then use their name in the subject line. Don’t just save it for the email body! This approach will help grab the recruiter’s attention right away. It is a trusted mutual contact, the hiring manager will even be more likely to hear you out and respond positively. Writing a subject line in all caps may get the recruiter’s attention, but only in the wrong way. It is the online version of yelling at someone, and that won’t help your application in any way. The goal here is to make your email as easy for the recruiter to read as possible, not give them anxiety while doing it! Using RooJet to automate your outreach efforts will make the whole process easier. All you have to do is set up your subject lines and email templates, as well as set up a workable timeline, and RooJet will do the rest for you. Cold email subject lines act as the gatekeeper, determining whether the prospect will read your email or not. As such, it is vital to get it right from this first step to increase your chances of landing your dream job through cold email. Do you have any other helpful tips or examples of subject lines that work? Please leave them in them in the comments below!